Willie O'Neill, who was part of the must successful squad in the Glasgow team's history, has died aged 70. Celtic Football Club have paid tribute after the death of former player and member of the famous Lisbon Lions squad Willie O’Neill. The 70-year-old’s death was announced by the club on Thursday. 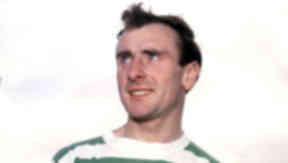 Willie, a full-back, spent a decade with Celtic after joining the club in 1959. He made his first-team debut two years later against Dunfermline Athletic in the Scottish Cup final replay on April 26, 1961. The Glasgow-born player remained at Celtic until 1969, making 86 appearances for the Hoops, 32 of which came in the 1966/67 season when Jock Stein’s Celtic won every tournament they entered. This included an important role for well-liked defender in the 1-0 League Cup final victory over Rangers. He also had the distinction of being Celtic’s first official substitute in a competitive game, coming on for Jimmy Johnstone against St Mirren in September 1966. Willie left Celtic for Carlisle United in 1969, but an ankle injury forced his retirement two years later. A statement on Celtic’s website described Willie as a “a popular part of the Lisbon Lions' squad revered by the Celtic support”. Funeral details for the former Celtic player will be released in due course.